The formation of a genetically modified organism constitutes the generation of a new organism, and so requires the application to, and approval of the Environment Risk Management Authority before any work can be undertaken. Different species and manipulations fall under different, containment facility specific HSNO Approvals. Fig1. 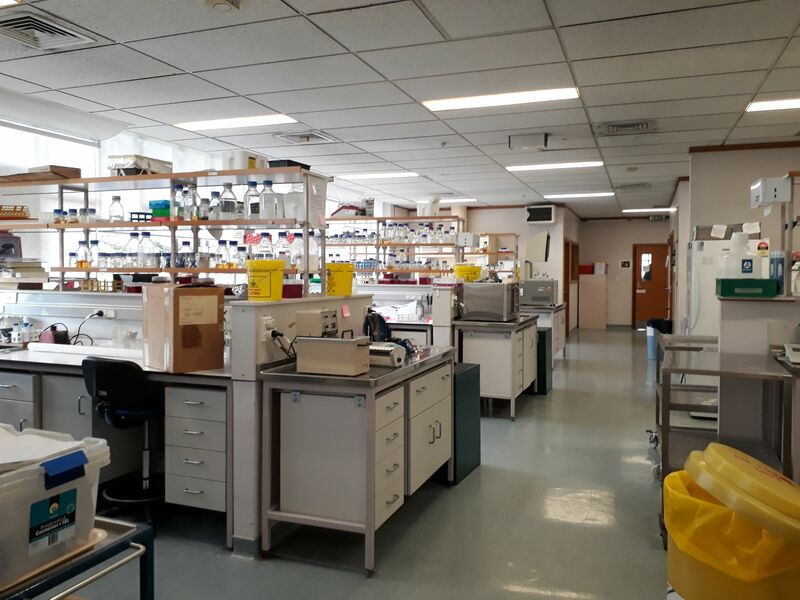 the PC1 laboratory in which the construct for our plant transformation was developed. Before work began in the lab, all lab team members were required to read the School of Biological Sciences (SBS) safety and containment document, and complete a quiz. We then undertook a laboratory specific safety tour, training in liquid and solid waste disposal, and the use of laboratory equipment. When working in the lab, safety was adhered to with the use of lab coats, closed in shoes and gloves. When appropriate, safety glasses were also used. Work with GMOs and Hazardous species also requires appropriate physical containment (PC). Containment facilities must be approved to one or more of the MAF/ERMA New Zealand Standards depending upon the activities undertaken within the facility. There are four levels of containment, ranging from PC1 to PC4, with PC1 being the least stringent. For our protein expression work, we were required to operate in PC1 containment. This is suitable to work with microorganisms which are not pathogens, do not produce toxic substances, and standard laboratory practices can adequately protect laboratory personal. All of the bacteria and equipment used in this work were be decontaminated by the use of chemical disinfectants (Vircon and Trigene) followed by autoclaving, before following general rules for the disposal of Biological Waste. The generation of genetically modified plants requires further containment in a PC2 facility. This is due to an increased environmental risk that GMO plants represent. All plant and soil material used in our work were autoclaved on site. Liquid waste must pass through a filter size of 100μm to trap any seeds. All seeds were soaked in bleach before disposal. The Plant hall has a double doored, positively pressurised anteroom for entry. When entering the facility, shoes must be covered with disposable overboots, and pocket free lab aprons worn. Around the doors there are sticky mats which serve as an extra barrier to accidental seed release. The plant hall itself is also contained with the PC1 School of Biological Sciences building. Fig2. 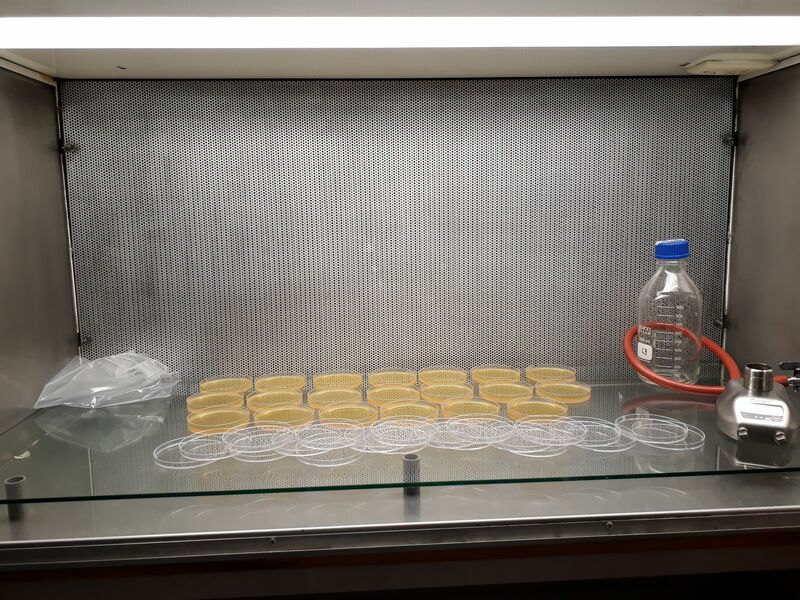 preparing sterile plates in the laminar flow hood, to be used for culturing our construct in E. coli. GMO08 UOA013 Escherichia coli, Mycobacterium smegmatis, Corynebacterium glutamicum, Saccharomyces cerevisiae, Pichia pastoris, Kluyveromyces lactis Genes sourced from non-prohibited animals including mammals (and humans), plants, fungi, RG1 bacteria, non- pathogenic protozoa, archaebacteria and viruses PC1- Fermentation not to exceed 15 litres. Must have spill containment in place capable of retaining all 15 litres.